This article is about the city in Scotland. For other uses, see Inverness (disambiguation). Inverness (/ɪnvərˈnɛs/ ( listen); from the Scottish Gaelic: Inbhir Nis [iɲɪɾʲˈniʃ], meaning "Mouth of the River Ness"; Scots: Inerness) is a city in the Scottish Highlands. It is the administrative centre for The Highland Council and is regarded as the capital of the Highlands. Inverness lies near two important battle sites: the 11th-century battle of Blàr nam Fèinne against Norway which took place on the Aird and the 18th century Battle of Culloden which took place on Culloden Moor. 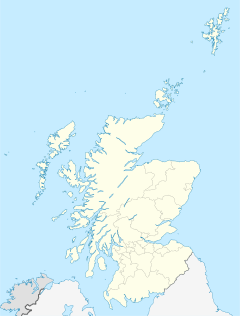 It is the northernmost city in the United Kingdom and lies within the Great Glen (Gleann Mòr) at its north-eastern extremity where the River Ness enters the Moray Firth. At the latest, a settlement was established by the 6th century with the first royal charter being granted by Dabíd mac Maíl Choluim (King David I) in the 12th century. The Gaelic king Mac Bethad Mac Findláich (MacBeth) whose 11th-century killing of King Duncan was immortalised in Shakespeare's largely fictionalized play Macbeth, held a castle within the city where he ruled as Mormaer of Moray and Ross. The population of Inverness grew from 40,969 in 2001 to 46,869 in 2012. The Greater Inverness area, including Culloden and Westhill, had a population of 59,969 in 2012. In 2018, it had a population of 69,989. Inverness is one of Europe's fastest growing cities, with a quarter of the Highland population living in or around it, and is ranked fifth out of 189 British cities for its quality of life, the highest of any Scottish city. In the recent past, Inverness has experienced rapid economic growth: between 1998 and 2008, Inverness and the rest of the central Highlands showed the largest growth of average economic productivity per person in Scotland and the second greatest growth in the United Kingdom as a whole, with an increase of 86%. Inverness is twinned with one German city, Augsburg, and two French towns, La Baule and Saint-Valery-en-Caux. Medieval Inverness suffered regular raids from the Western Isles, particularly by the MacDonald Lords of the Isles in the 15th century. In 1187 one Domhnall Bán (Donald Ban) led islanders in a battle at Torvean against men from Inverness Castle led by the governor's son, Donnchadh Mac An Toisich (Duncan Mackintosh). Both leaders were killed in the battle, Donald Ban is said to have been buried in a large cairn near the river, close to where the silver chain was found. Local tradition says that the citizens fought off the Clan Donald in 1340 at the Battle of Blairnacoi on Drumderfit Hill, north of Inverness across the Beauly Firth. On his way to the Battle of Harlaw in 1411, Donald of Islay harried the city, and sixteen years later James I held a parliament in the castle to which the northern chieftains were summoned, of whom three were arrested for defying the king's command. Clan Munro defeated Clan Mackintosh in 1454 at the Battle of Clachnaharry just west of the city. Clan Donald and their allies stormed the castle during the Raid on Ross in 1491. Inverness played a role in the Jacobite rising of 1689. In early May, it was besieged by a contingent of Jacobites led by MacDonell of Keppoch. The town was actually rescued by Viscount Dundee, the overall Jacobite commander, when he arrived with the main Jacobite army, although he required Inverness to profess loyalty to King James VII. In 1715 the Jacobites occupied the royal fortress as a barracks. In 1727 the government built the first Fort George here, but in 1746 it surrendered to the Jacobites and they blew it up. Culloden Moor lies nearby, and was the site of the Battle of Culloden in 1746, which ended the Jacobite rising of 1745–46. The Rose Street drill hall was completed in around 1908. Inverness and its immediate hinterland have a large number of originally Gaelic place names, as the area was solidly Gaelic-speaking until the late 19th century. Several springs which were traditionally thought to have healing qualities exist around Inverness. Fuaran Dearg, which translates as the "Red Spring", is a chalybeate spring located near Dochgarroch. Fuaran a' Chladaich ("The Spring on the Beach") near Bunchrew was once accessed by a causeway from the shore. Although submerged at high tide it continues to bubble and was traditionally known for treating cholera. Fuaran Allt an Ionnlaid ("Well of the Washing Burn") at Clachnaharry, where the Marquis of Montrose was allowed to drink while on his way from his capture in Sutherland to his execution in Edinburgh, was known for treating skin conditions. Also at Clachnaharry, Fuaran Priseag ("The Precious Well") was said to have been blessed by Saint Kessock and could treat weak and sore eyes, as well as expelling evil and shielding curses if a silver coin was offered. Tobar na h-Oige ("Well of the Young") is located near Culloden and was known for curing all ailments. Fuaran a' Chragan Bhreag ("Well of the Speckled Rock") is located near Craig Dundain and Fuaran na Capaich ("The Keppoch Well") is located near Culloden. Although a Gaelic name itself, Craig Phadraig is alternatively known as Làrach an Taigh Mhóir, or "the place of the Great house". "Several Gaelic place names are now largely obsolete due to the feature being removed or forgotten. Drochaid an Easain Duibh ("Bridge by the Small Dark Waterfall"), referred to in the tale Aonghas Mòr Thom na h-Iubhraich agus na Sìthichean ("Great Angus of Tomnahurich and the Fairies") has not yet been located within Inverness and Slag nam Mèirleach (meaning "Robbers' hollow"), adjacent to Dores Road in Holm is no longer in use. Until the late 19th century, four mussel beds existed on the delta mouth of the River Ness: Scalp Phàdraig Mhòir ("Scalp of Great Patrick"), Rònach ("Place of the Seals"), Cridhe an Uisge ("The Water Heart") and Scalp nan Caorach ("Scalp of the Sheep") – these mussel beds were all removed to allow better access for fishing boats and ships. Beinn Bhuidhe Bheag – "Little Yellow Hill"
Beinn Uan – "Lamb Hill"
Cnoc na Mòine – "The Peat Hill"
Cnoc na Gaoithe – "The Hill of the Wind"
Cnoc an t-Seòmair – "The Hill of the Room"
Creag Liath – "Grey Crag"
Creag nan Sidhean – "The Crag of the Fairies"
Doire Mhòr – "Great Oakwood"
Carn a' Bhodaich – "The Old Man's Cairn"
Meall Mòr – "Great Hill"
In the colonial period, a Gaelic speaking settlement named New Inverness was established in McIntosh County, Georgia, by settlers from in and around Inverness. The name was also given by expatriates to settlements in Quebec, Nova Scotia, Montana, Florida, Illinois, and California. The name Inverness is also given to a feature on Miranda, a moon of the planet Uranus, as well as a 2637 m tall mountain in British Columbia, Canada. Inverness is also known by its nicknames Inversnecky or The Sneck, with its inhabitants traditionally known as Clann Na Cloiche ("Children of the Stone" in Gaelic) owing to the importance of the Clach Na Cudainn stone in the city's history. The National Records of Scotland define Inverness as the urban area west of the A9. To produce a greater Inverness figure including the villages of Balloch, Culloden, Smithton, and Westhill, it is necessary to aggregate NRS figures for each locality. Inverness is situated at the mouth of the River Ness (which flows from nearby Loch Ness) and at the south-western extremity of the Moray Firth. The city lies at the end of the Great Glen with Loch Ness, Loch Ashie and Loch Duntelchaig to the west. Inverness's Caledonian Canal also runs through the Great Glen, connecting Loch Ness, Loch Oich, and Loch Lochy. The Ness Islands, a publicly owned park, consists of two wooded islands connected by footbridges and has been used as a place of recreation since the 1840s. Craig Phadraig, once an ancient Gaelic and Pictish hillfort, is a 240 m (790 ft) hill which offers hikes on a clear pathway through the wooded terrain. Inverness lies on the Great Glen Fault. There are minor earthquakes, usually unnoticed by locals, about every 3 years. The last earthquake to affect[clarification needed] Inverness was in 1934. Like most of the United Kingdom, Inverness has an oceanic climate (Köppen: Cfb). Its sheltered location makes it one of the driest areas in Scotland. Inverness sees around 18 days of falling snow per year, and the record accumulation of snow was 36 cm (14 in) in January 2010. The climate here is much colder than in more southerly parts of Britain. The highest temperature recorded was 29.7 °C (85.5 °F) in July 2006 and June 2018, and the lowest temperature recorded was −18.7 °C (−1.7 °F) in January 2010. Typically, the warmest day of the year rises to around 25 °C (77 °F) and the coldest night falls to around −11 °C (12 °F). The climate in this area is characterised by small differences between high and low temperatures[clarification needed], as well as adequate rainfall year-round. Raigmore Hospital is the main hospital in Inverness and the entire Highland region. The present hospital opened in 1970, replacing wartime wards dating from 1941. Raigmore is also a teaching hospital catering for both the Universities of Aberdeen and Stirling. A new Centre for Health Science (CfHS) is located behind the hospital. This is funded by Highlands and Islands Enterprise, the Scottish Executive and Johnson & Johnson. Phase I of this opened in early 2007, with phase II and phase III housing The Diabetes Institute opening in 2009. The University of Stirling moved its nursing and midwifery teaching operations from Raigmore Hospital to the CfHS. The University of the Highlands and Islands also has strong links with the centre through its Faculty of Health. Inverness City Centre lies on the east bank of the river and is linked to the west side of the town by three road bridges – Ness Bridge, Friars Bridge and the Black (or Waterloo) Bridge – and by one of the town's suspension foot bridges, the Greig Street Bridge. The traditional city centre was a triangle bounded by High Street, Church Street and Academy Street, within which Union Street and Queensgate are cross streets parallel to High Street. Between Union Street and Queensgate is the Victorian Market, which contains a large number of small shops. The main Inverness railway station is almost directly opposite the Academy Street entrance to the Market. From the 1970s, the Eastgate Shopping Centre was developed to the east of High Street, with a substantial extension being completed in 2003. Inverness College is situated in the city and is a part of the University of the Highlands and Islands, a federation of 15 colleges and research institutions in the Highlands and Islands of Scotland delivering higher education. The 80-hectare (200-acre) campus at Beechwood, just off the A9 south of Inverness, is considered to be one of the most important developments for the region over the next 20 years. The principal of UHI, James Fraser, said: "This is a flagship development which will provide Inverness with a university campus and vibrant student life. It will have a major impact on the city and on the Highlands and Islands. UHI is a partnership of colleges and research centres throughout the region, and the development of any one partner brings strength to the whole institution." Inverness is linked to the Black Isle across the Moray Firth by the Kessock Bridge. It has a railway station with Abellio ScotRail services to Perth, Edinburgh, Glasgow, Aberdeen, Thurso, Wick and Kyle of Lochalsh. Inverness is connected to London Euston by the Caledonian Sleeper, which departs six times a week and by the London North Eastern Railway operated Highland Chieftain to London King's Cross which runs daily. Three trunk roads link Inverness with the rest of Scotland: the A9 north to Thurso and Wick, as well as south to Perth and the Central Belt, A82 to Glasgow via Fort William and A96 to Elgin and Aberdeen. The bypass, known as the Inverness Trunk Road Link (TRL), is aimed at resolving Inverness's transport problems and has been split into two separate projects, the east and west sections. The east section will bypass Inshes Roundabout, a notorious traffic bottleneck, using a new road linking the existing Southern Distributor with the A9 and the A96, both via grade separated interchanges. This proposed new link road would bypass Inshes roundabout, as stated before, and separate strategic traffic from local traffic as well as accommodating proposals for new development at the West Seafield Retail and Business Park and also a new UHI campus. At the west end, two options for crossing the river and canal were developed. One involving a high level vertical opening bridge which will allow the majority of canal traffic to pass under without the need for opening. The other involved a bridge over the river and an aqueduct under the canal. Both of these designs are technically complex and were considered in detail along by the key stakeholders involved in the project. Ultimately it was decided that a bridge over the river and a tunnel under the canal were the best option, although more expensive. The Port of Inverness is located at the mouth of the River Ness. It has four quays and receives over 300 vessels a year. Inverness Airport is located 13 km (8.1 mi) northeast of the city and has scheduled flights to airports across the UK including London, Manchester, Belfast and the islands to the north and west of Scotland, as well as a number of flights to Europe. Flybe operate flights to Belfast, Birmingham and a seasonal service to Jersey. Loganair operate Saab 340 and Saab 2000 aircraft on routes to Benbecula, Dublin, Kirkwall, Stornoway and Sumburgh. Flybmi operates an Embraer regional jet on services to Bergen and Manchester on behalf of Loganair. EasyJet operate Airbus aircraft to London Gatwick three times per day, Luton twice a day and Bristol. British Airways operates a daily service to London Heathrow, and KLM operate a daily service to Amsterdam. Inverness was an autonomous royal burgh, and county town for the county of Inverness (also known as Inverness-shire) until 1975, when local government counties and burghs were abolished, under the Local Government (Scotland) Act 1973, in favour of two-tier regions and districts and unitary islands council areas. The royal burgh was then absorbed into a new district of Inverness, which was one of eight districts within The Highland Council region. The new district combined in one area the royal burgh, the Inverness district of the county and the Aird district of the county. The rest of the county was divided between other new districts within the Highland region and the Western Isles. Therefore, although much larger than the royal burgh, the new Inverness district was much smaller than the county. In 1996, under the Local Government etc (Scotland) Act 1994, the districts were abolished and the region became a unitary council area. The new unitary The Highland Council, however, adopted the areas of the former districts as council management areas, and created area committees to represent each. The Inverness committee represented 23 out of the 80 Highland Council wards, with each ward electing one councillor by the first past the post system of election. Management area and committee area boundaries later became disconnected as a result of changes to ward boundaries in 1999. Ward boundaries changed again in 2007, and the council management areas were replaced with three new corporate management areas. Within the corporate area there is a city management area covering seven of the nine wards, the Aird and Loch Ness ward, the Culloden and Ardersier ward, the Inverness Central ward, the Inverness Millburn ward, the Inverness Ness-side ward, the Inverness South ward and the Inverness West ward. The Nairn and Cawdor ward and the Badenoch and Strathspey ward complete the corporate area. Wards in the city management area are to be represented on a city committee as well as corporate area committees. 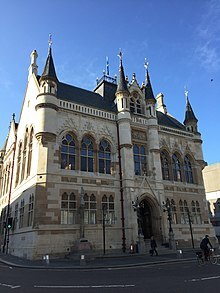 In 2000, city status was granted to the Town of Inverness, and letters patent were taken into the possession of the Highland Council by the convener of the Inverness area committee. These letters patent, which were sealed in March 2000 and are held by Inverness Museum and Art Gallery, create a city of Inverness, but do not refer to anywhere with defined boundaries, except that Town of Inverness may be taken as a reference to the burgh of Inverness. As a local government area the burgh was abolished 26 years earlier, in 1975, and so was the county of Inverness for which the burgh was the county town. Nor do they refer to the former district or to the royal burgh. The city is home to four football clubs. 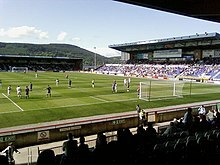 Inverness Caledonian Thistle was formed in 1994 from the merger of two Highland League clubs, Caledonian and Inverness Thistle. "Caley Thistle" of the Scottish Championship plays at the Tulloch Caledonian Stadium. The town's second football club, Clachnacuddin, plays in the Highland League. Inverness Citadel was another popular side which became defunct, but had its name revived. The third football side is Inverness City who play in the North Region Juniors and were formed in 2006. Inverness Athletic became the fourth, joining the North Caledonian Football League in 2016. Highland RFC is the local rugby union club that competes regularly in the Tennants National League 2. It has enjoyed recent promotions in the past several years and continues to be a hub for rugby in the North of Scotland. Inverness Library is located in Farraline Park, housed in what was originally the Bell's school, designed by William Robertson in the Greek Revival style. The school was built with help from a £10,000 donation from Dr Andrew Bell in 1837. Historically, Inverness had a solidly Scottish Gaelic speaking population, with the majority of the population having Gaelic as their first language. From approximately the end of the 19th century, following the 1872 Education Act, Inverness suffered a decline in the number of Gaelic speakers in line with the rest of the once Gaidhealtachd / Scottish Highlands. 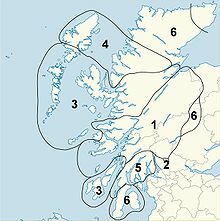 Despite the local dialect of Scottish Gaelic gradually falling out of use (although it continued to affect local English language dialect), the language is still spoken in other dialects and standardised forms. By the end of the 19th century, some rural areas to the south east of Inverness still had completely Gaelic speaking populations, such as Strath Dearn where almost 100% of the population were still Gaelic speaking. 1704: Close to 100% of the population was fluent in Gaelic with over 75% of the population only able to speak Gaelic. Edward Lhuyd published major work on Inverness Gaelic and after collecting data from between 1699 and 1700, his findings showed a distinct dialect in the area. The clear dialect of Inverness Gaelic was held in high regard by speakers of other forms, such as those from Lewis, Sutherland and Ross. Gaelic remained the principal language of Invernessians for the rest of the 18th century, despite growing pressure from outwith the Highlands in both political and social contexts. 1798: Thomas Garnett (Professor of Natural Philosophy and Chemistry in the Royal Institution of Great Britain) observed that Inverness had become largely bilingual with Invernessians using Gaelic as the language of the home but English as the language of foreign trade – however, the older generation at the time generally only had the Gaelic. Speaking of those in the countryside immediately surrounding Inverness, Garnett stated that although in Inverness both Gaelic and English "are spoken promiscuously...the language of the country people is Gaelic." Inverness has a unique accent of Scottish English. While the r's in most places in Scotland are tapped or rolled, in Inverness they are not. This has contributed to some considering the accent to be more akin to those of Ireland and the English West Country than those of Scotland. However, due to the overall decay of local accents across the United Kingdom, this is less prominent today than it once was. There is no Catholic cathedral in the area as the Diocese's cathedral (St Mary) is at Aberdeen, the seat of the Diocese of Aberdeen. The Catholic population is served by two parish churches: St Mary's, Inverness founded in 1837, is the older of the two and the first Catholic church founded in Inverness since the Reformation. St Ninian's was built during the 1960s and 1970s. Porterfield Prison, officially HMP Inverness, serves the courts of the Highlands, Western Isles, Orkney Isles and Moray, providing secure custody for all remand prisoners and short-term adult prisoners, both male and female, who are segregated. Shinty is an integral part of the Highlands and Islands. As the capital of the Highlands, Camanachd Association is based in Inverness and the city often hosts a wealth of Shinty finals such as the Camanachd Cup Final (the pinnacle of Shinty) as well as the international game of Shinty and Irish hurling. Despite Inverness Shinty Club not being particularly successful in recent years, some of the towns and villages that surround the city have been, such as Kiltarlity who are the home of Lovat Shinty Club (recent winners of the MacTavish Cup 2013) and Glen Urquhart. Karen Gillan – Actress, best known as Amy Pond, the Doctor's Companion in Doctor Who and as Nebula in the Guardians of the Galaxy series of the Marvel Cinematic Universe. ^ Butlin, Heather. "Highland profile - key facts and figures". www.highland.gov.uk. Archived from the original on 23 March 2019. Retrieved 25 July 2018. ^ The Highland Council website Archived 20 July 2007 at the Wayback Machine. Retrieved 6 March 2006. ^ "Inverness city". Inverness-scotland.com. Retrieved 14 July 2010. ^ "Destinations :: City Guides :: Inverness". Loganair. Retrieved 30 October 2012. ^ a b c d "Mid-2012 Population Estimates for Settlements and Localities in Scotland". National Records Scotland (NRS). Retrieved 29 October 2015. ^ "Inverness: the new Shangri-La?". Newstatesman.com. Retrieved 30 October 2012. ^ "Overview of Inverness". Scottish-places.info. Retrieved 14 July 2010. ^ "Is your home recession proof?". The Daily Telegraph. London. 7 February 2008. Retrieved 14 July 2010. ^ "BBC News – Central Highlands 'Scotland's top economic performer'". BBC. 18 July 2011. Retrieved 25 August 2011. ^ "City of Inverness Town Twinning Committee". Inverness-town-twinning.com. Retrieved 14 July 2010. ^ "UHI". Inverness.uhi.ac.uk. Retrieved 22 April 2015. ^ "Inverness College". Inverness.uhi.ac.uk. Retrieved 22 April 2015. ^ "Inverness happiest place in Scotland". BBC. Retrieved 21 May 2014. ^ "Inverness is Scotland's happiest place". Herald Scotland. Retrieved 16 September 2015. ^ "''Craig Phadrig, Inverness'', Walk in Scotland, Visitscotland". Walking.visitscotland.com. 27 March 2008. Retrieved 14 July 2010. ^ "Site Record for Torvaine, Caledonian Canal, Inverness; Torvean". Royal Commission on the Ancient and Historical Monuments of Scotland. . Silver chain was found at grid reference NH65424346 when digging the Caledonian Canal in 1809. ^ "Inverness churches". Churchesinverness.com. Archived from the original on 29 June 2010. Retrieved 14 July 2010. ^ "Site Record for Blar Nam Feinne". Royal Commission on the Ancient and Historical Monuments of Scotland. . Blar Nam Feinne is on Cnoc na Moine (grid reference NH595433). ^ "Site Record for Torvaine". Royal Commission on the Ancient and Historical Monuments of Scotland. . The cairn at grid reference NH65424346 disappeared in the 19th or 20th centuries, it has also been claimed to mark the resting place of St Bean(Beóán) the Culdee. ^ "Site Record for Clachnaharry, Clan Battle Monument, Clachnaharry Memorial". Royal Commission on the Ancient and Historical Monuments of Scotland. . Battle of Clachnaharry took place at grid reference NH6454946448. ^ George Buchanan's (1506 -1582), History of Scotland, completed in 1579, first published in 1582. ^ "Inverness on Undiscovered Scotland". Undiscoveredscotland.co.uk. Retrieved 14 July 2010. ^ "A'Chleit (Argyll), A' Chleit" (PDF). Archived from the original (PDF) on 27 July 2011. Retrieved 14 July 2010. ^ Maclean, the Nonagenarian (25 July 1886). "Reminiscences of a clachnacuddin nonagenarian". Inverness, Donald Macdonald. Retrieved 25 July 2018 – via Internet Archive. ^ "Transactions of the Inverness Scientific Society and Field Club, vol. 1, p. 126". Am Baile. Retrieved 30 October 2012. ^ "Around Clach na Cùdainn: Some Musings on the Gaelic Place Names of Inverness – Scottish Corpus of Texts and Speech". Scottishcorpus.ac.uk. Retrieved 25 August 2011. ^ "Mount Revelstoke National Park : Revelstoke, BC, Canada". Kootenayseh.com. Archived from the original on 26 June 2010. Retrieved 14 July 2010. ^ "Mid-2010 Population Estimates - Settlements in alphabetical order". National Records Scotland (NRS). Retrieved 29 October 2015. ^ "Mid-2010 Population Estimates - Localities in alphabetical order". National Records Scotland (NRS). Retrieved 29 October 2015. ^ "Mid-2008 Population Estimates - Settlements in alphabetical order". National Records Scotland (NRS). Retrieved 29 October 2015. ^ "Mid-2008 Population Estimates - Localities in alphabetical order". National Records Scotland (NRS). Retrieved 29 October 2015. ^ "Mid-2006 Population Estimates for Settlements in Scotland". National Records Scotland (NRS). Retrieved 29 October 2015. ^ "Mid-2006 Population Estimates for Localities in Scotland". National Records Scotland (NRS). Retrieved 29 October 2015. ^ "Mid-2004 Population Estimates for Settlements in Scotland". National Records Scotland (NRS). Retrieved 26 June 2013. ^ "Mid-2004 Population Estimates for Localities in Scotland". National Records Scotland (NRS). Retrieved 26 June 2013. ^ "Mid-2003 Population Estimates for Settlements in Scotland". National Records Scotland (NRS). Retrieved 29 October 2015. ^ "Mid-2003 Population Estimates for Localities in Scotland". National Records Scotland (NRS). Retrieved 29 October 2015. ^ a b c d "Scotland's Census 2001 - KS01 Usual Resident Population". National Records Scotland (NRS). Retrieved 29 October 2015. ^ "River Ness – Inverness – Ness Islands". nessriver.co.uk. Retrieved 25 August 2011. ^ "Walk Scotland – Perfect Walks – Dunain Hill & Craig Phadraig". Walking.visitscotland.com. 27 March 2008. Retrieved 25 August 2011. ^ "Inverness Royal Academy". Invernessroyal.highland.sch.uk. 16 August 1934. Archived from the original on 9 June 2004. Retrieved 25 August 2011. ^ "Inverness, Scotland Köppen Climate Classification (Weatherbase)". Weatherbase. Retrieved 4 March 2019. ^ "Inverness Climate 1981 -2010". Met Office. Retrieved 26 March 2016. ^ "Raigmore Hospital". Nhshighland.scot.nhs.uk. 3 March 1999. Retrieved 14 July 2010. ^ "Supporting Economic Development in the Highlands & Islands through Scotland's Universities" (PDF). Scottish Funding Council. Archived from the original (PDF) on 7 February 2017. Retrieved 6 February 2017. ^ "Inverness Town Centre Map". Stockphotography.co.uk. Archived from the original on 20 May 2009. Retrieved 14 July 2010. ^ "Inverness Shops". Explore-inverness.com. 15 March 2010. Archived from the original on 25 March 2010. Retrieved 14 July 2010. ^ "Welcome". Inverness Campus. Archived from the original on 4 March 2012. Retrieved 25 August 2011. ^ "Inverness Campus". Inverness Campus. 22 June 2010. Archived from the original on 20 August 2010. Retrieved 14 July 2010. ^ The Highland Main Line, the Aberdeen-Inverness Line and the Far North Line meet at Inverness (Ordnance Survey grid reference NH667454). Also, Kyle of Lochalsh services run to and from Inverness via the Far North Line to Dingwall. ^ "The Highland Council website". Highland.gov.uk. 16 March 2007. Archived from the original on 27 May 2010. Retrieved 14 July 2010. ^ "The Inverness Courier". The Inverness Courier. 28 September 2007. Archived from the original on 22 October 2007. Retrieved 14 July 2010. ^ "Transport Scotland - A9 dualling Perth to Inverness". www.transportscotland.gov.uk. Retrieved 25 July 2018. ^ "Average speed cameras for A9 from Dunblane to Inverness". BBC News. 26 July 2013. ^ Ordnance Survey grid reference for Inverness Airport (access from A96 road): NH776508. ^ "Local Government etc (Scotland) Act 1994". Office of Public Sector Information. Archived from the original on 1 March 2010. Retrieved 14 July 2010. ^ "Local Governance (Scotland) Act 2004". Office of Public Sector Information. Retrieved 14 July 2010. ^ Inverness awarded city status, BBC News, December 18, 2000. ^ "Coat of arms rejected in city status quer". The Inverness Courier. 29 January 2008. Retrieved 16 October 2012. ^ Fergus Ewing MSP, Scottish Parliament website. Retrieved 10 July 2007. ^ "Scottish Hockey". Scottish Hockey. Archived from the original on 19 October 2013. Retrieved 25 August 2011. ^ "Inverness Blitz" Archived 23 December 2008 at the Wayback Machine invernessblitz.co.uk. Retrieved 20 September 2008. ^ "''Highland 2007'', Information on the European Pipe Band Championships". Highland2007.com. Retrieved 14 July 2010. ^ Campbell, J F. Popular Tales of the West Highlands. Books.google.co.uk. Retrieved 30 October 2012. ^ "Full text of "Transactions"". Archive.org. Retrieved 30 October 2012. ^ "Gaelic Primary School education set to expand in Inverness area (12/11/09) – Comann Nam Pàrant – Inbhir Nis". Cnp-inbhirnis.com. 12 November 2009. Archived from the original on 8 July 2011. Retrieved 14 July 2010. ^ "About Inverness Gaelic Choir". Inverness Gaelic Choir. Retrieved 13 October 2010. ^ Urquhart, Frank (16 October 2010). "Inverness to host the Royal National Mòd". Edinburgh: Scotsman Newspaper. Retrieved 16 October 2010. ^ "Old High Church information". www.oldhighststephens.com. Retrieved 19 June 2013. ^ "Old High St Stephen's website". Oldhighststephens.com. Retrieved 14 July 2010. ^ "UHI Millennium Institute website". Uhi.ac.uk. Retrieved 14 July 2010. ^ "Charles Fraser-Mackintosh". Am Baile. Retrieved 25 August 2011. ^ "Màiri Mhòr nan Òran". Am Baile. Retrieved 25 August 2011. This article incorporates text from a publication now in the public domain: Chisholm, Hugh, ed. (1911). "Inverness" . Encyclopædia Britannica. 14 (11th ed.). Cambridge University Press. pp. 718–719.